Coin reader / token machine. IP66 protection* (*except thermal printer). 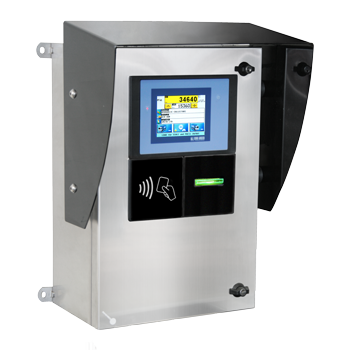 3590ETPBOXRFID Self-service system with RFID reader. AF03GT software for weighbridge management. USBEGT Built-in USB port kit for data storing on USB key. To be coupled with touch screen weight indicators. It does not occupy serial ports. Fitted with USB key for PC. TAKE NOTE: this interface is not available on its own. SETHNET (S1) External RS232/Ethernet interface. Suitable for creating multi-operator weighbridge systems in a network. Compatible only with the AF03 software. RPT60 Thermal paper roll 80m long, 60mm wide. NET price. 13mm hole, 80mm external diameter. RFIDCARD Set of 10 RFID Cards for use with swipe reader.